Man's sterling silver ring inlaid with black onyx. Silver ring inlaid with spiderweb turquoise and gem silica. Birdseye turquoise wedding ring with lab created opal inlaid in sterling silver by Hileman Silver Jewelry. 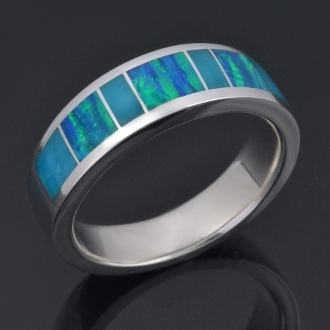 This turquoise wedding ring is inlaid with 4 pieces of Kingman birdseye turquoise alternating with 3 pieces of lab created opal inlay. The turquoise is a nice mix of light blue colors that create a faint birdseye pattern. The lab created opal fires bright greens and blues. The ring is about 7mm wide at the top with a slight taper to the bottom. It will be made to order in your ring size in 4 to 6 weeks. This ring style is also available in other metals (Continuum silver, stainless steel, gold and platinum) as well as other inlay materials. A matching woman's wedding ring is available if you are looking for a matching ring set. *We recommend upgrading to Continuum sterling silver for added durability and tarnish resistance if you are choosing this ring as a wedding band. Just check the box next to Continuum silver and type "upgrade to Continuum" in the text box. The lab created opal in this man's ring is a top quality synthetic opal grown under laboratory conditions. The manmade opal's chemical composition is the same as natural opal with the exception of water content. Australian opal contains about 4% water and lab created opal contains no water. Instead, the water is replaced with resin. The resin gives the synthetic opal more durability and helps to resist cracking. Laboratory grown opal gives you all the fire and colors of top grade natural opal at a much more affordable price with with the added benefit of increased durability.